Buying a home that has Brazilian Cherry Wood Floor throughout. They all need to be sanded down, and we are going to restain them a brown color. The Foyer/Kitchen has a 1/2" thick 18"x18" white travertine flooring with radiant heat under it. If it didnt have radiant heat under it, I would def say it had to go, cause we hate, hate hate, cold tile floors. so we were thinking of keeping it. a Floor refinishing guy, said he could hone it down, sand it to a like new finish, then polish them up. he would fill any cracks and it would be good to go. it costs 1700 bucks. Replacing the flooring with brazilian cherry hardwood to match the rest of the house would probably cost me 7500.
another benefit of replacing would be there is a 1-1/2" step down off the kitchen floor into the other rooms. 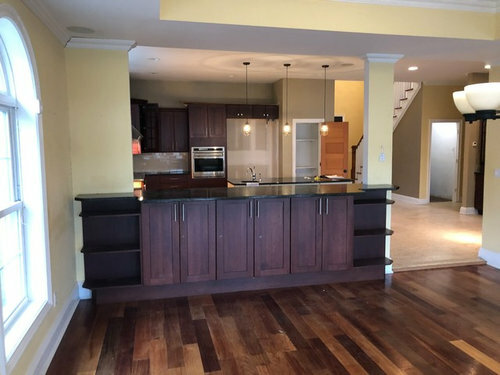 cant decide what to do, hate to get rid of a valuable floor, i dont know how we would like living with it, we have only ever had hardwood floors in our house. We are likely remodeling the kitchen a bit, new counters, new appliances, backsplash. maybe refinishing the cabinets. if we are going to address the floor this is the time. You need a cohesive plan for either keeping the stone or ditching it. If you want to keep it, it will determine the warmth or coolness of your color scheme.mif you want cooler, grayer color, ditch the stone. If you are good,with warmer colors, keep it. 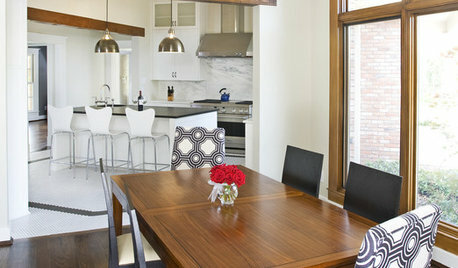 The decision must b stakeholders with all other choices, like cabinets, trim and wall color in mind. If you're going to remodel the kitchen in the future, don't redo the floors NOW. Do it THEN. 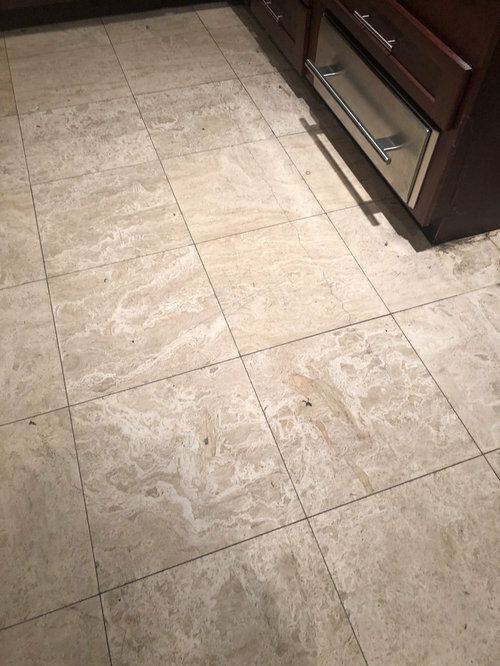 Does the travertine actually need refinishing? Floor Refinish or Replace? Anyone have experience with Brazilian Cherry? I agree about repainting (oh, it will be "fun" to paint over red, even with the new types of paint that "make it easier") and suggest that you live with the floor a bit longer to get used to it. One advantage to the various tones in the floor, is that it won't show dust and stuff as quickly. 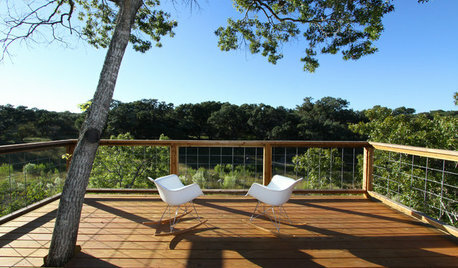 We have oak floors that were stained "black cherry" by the previous owners. They look gorgeous when clean and polished...for about three days. You need to sweep and dust EVERYTHING pretty nearly every day to keep it looking good. PLEASE help! Looking to refinish & fill-in grooves on hardwood floors. There is a wood filler product which the floor installer/refinisher professionals use to fill before sanding and refinishing. I think that will work in this case. Help! Hardwood floors in 100 year old church/hous can't be refinished. If these floors are 100 years old, they've lived their life. Most likely the entire floor is &quot;too thin&quot; (too close to the tongue/groove) to refinish. Which means no matter what part of this floor you salvage you can never refinish. 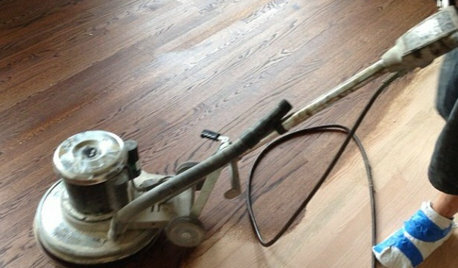 When a wood floor is sanded and then recoated, a thin amount of wood is sanded off (3mm - 5mm per refinishing). 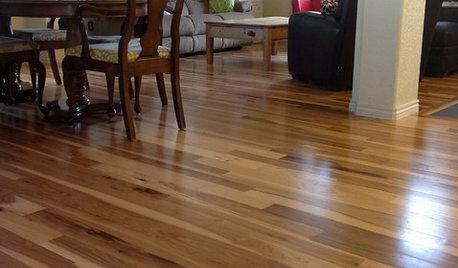 A 3/4&quot; solid hardwood has 60 - 100 years of life in it. As lovely as they are, they probably can't be used as flooring. If you salvage them, you will probably have to use them as decor somewhere else. Sad as it is, they have done their duty. I would honour them by replacing them with a beautiful, new, magnificent solid hardwood to carry on the 100 year legacy of this building. That way you have another 100 years without worrying about &quot;what floor&quot; to buy over your lifetime. Let them rest. yes only changing the floors if remodeling the kitchen now. yes it desperately needs refinishing. Are you sure you understand how Travertine is supposed to look? All the honing, sealing and finishing will never make it have the shiny look of ceramic tile. It is a natural stone, so it will always look like stone (not shiny; relatively rough surface with pores). Once you get used to it you may learn to like the Travertine more. 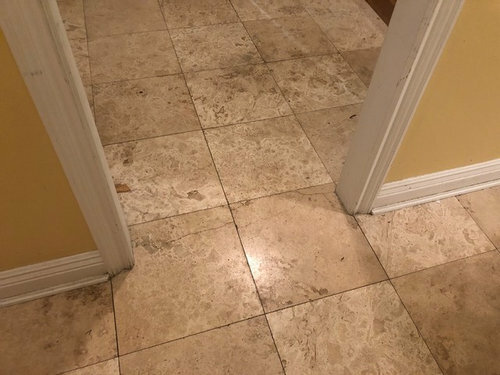 I would pay to have Travertine floors cleaned, especially if the grout lines are getting too dark, but having it refinished seems like a futile effort. It will be back to its normal stone look 3-6 months after you get it refinished. I would rip the tile out. I don't like the look of them at all, but that's just my personal opinion. I know it wont shine, i wouldnt want it to. i have travertine my bathrooms now. although it is beige instead of white. How much stone dust is that going to create to get in every nook and cranny? goign to be a ton of work going on in the house, they said they should be the last step, after painter and everything. they use a ton of water on the floors they said. If you're going to refinish the wood floors before moving in and you're considering adding the kitchen, you'd likely want to have it flow seamlessly through the kitchen. 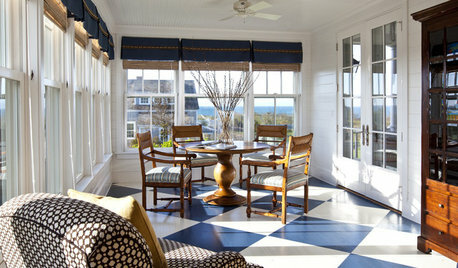 This means that you MUST replace the kitchen floor before the wood refinishing. Even though I'm a wood floor dealer I don't like it in kitchens. Then again I loathe having such a tall transition at a highly trafficked doorway. Do your kitchen plans include lightening the cabinets? If not, I'd hesitate to have a darker floor. When weighing decisions like this, I picture a set of scales, and visualize putting pros and cons on each side. In your case it's about even for me. Tough call, but my frugal nature would probably win out in favor of keeping the stone floor. Right now the stone floors are in kitchen, foyer, hallway, and mud room. If replacing with hardwood, should I just do in all these rooms so they are the same level? Or is it okay to step down from mud room? It sounds like you want it gone. So go ahead and do it. I'm fairly sure the tiles were put in after the wood. How? Because the wood is going to have 1/2" - 3/4" of height. A finished stone tile will have a height of around 1". The in-floor heating system will add another 1/2" or so. If these two are done at the same time, then the floor height difference should only be 1/2" or so. If you have a height difference of 1 1/2" AFTER the wood is installed it means the stone might just be sitting on TOP OF the original floor. Go ahead and remove this floor. The transition it has created is very, very, very, very high. I would remove it before someone brakes a toe. Please make sure you can source the same TYPE of Jatoba (same thickness, same cut, same width) before you make your decisions. thanks. the building plans call show the tile, so i think that was the plan from day one, i would assume the tiles are on the plywood subfloor, plus 1-1/2" 1-3/4 of mud or so. 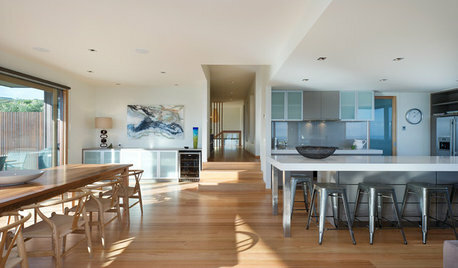 Being able to refinish those floors is one of the biggest advantages of real wood flooring. And it sounds like the previous owner paid for you to have that ability :-) I would see about leaving the stain off the floor. It may be too dark. Natural would be very pretty. If this is on a wood-joist subfloor then the extra height (of the tiles) MIGHT be coming from the extra layer of plywood underlayment. This is common when a tile/stone is laid. These HEAVY floors need extra reinforcing (deflection rating is based on the distance between joists AND the total thickness of the subfloor). 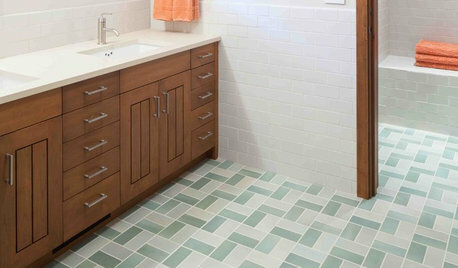 To do this properly, the extra layer of subfloor material would have been added to the entire space...not just the tile. That way the wood floor would be sitting at the same height as the stone...but something tells me they probably missed that step....because there is a 1.5 inch STEP down to the hardwood. Anyway you slice it, removing the stone AND the heating system and putting in hardwood will remove that 1.5" height difference. And that is a HUGE plus. I feel like noone would remove this beatiful (when cleaned up) and expensive stone and put down hardwood. i mean thats the first thing i wanted to do when i walked in the door. now i am coming around to keeping it. how much will removal of tile and mud cost me approximately? If you can afford to do it along with your remodeling plans, I would definitely remove it. That lip going in and out of the kitchen would be the deciding factor to me. That is a tripping hazzard. I would prefer the hardwood, over the tile, and am not fond of travertine anyway, to me, it always looks dirty. Seeing where the tile is broken tells me that the floor was not sufficiently rigid to support the travertine. (Broken in the doorway and a long break across multiple tiles in another area. I would not waste money on trying to restore it. In the end, you will still have a lot of broken tile and a tripping hazard. Good catch ci_lantro! I missed those! With a floor that is already starting to fail (those broken pieces in the doorway and then the long crack across multiple tiles in the kitchen) are big indicators that the weight of the stone (and the mud and the heating system, etc) is too much for the wood-joist system below it. You might as well go ahead and jack it out. Just remember with Jatoba, the new stuff will look like a VERY different colour when it is raw. Once everything is sanded down and then stained it *should all look the same. Relax. The old wood has darkened (because that's what Jatoba does...it gets DARKER in sunlight/light). It will look light once again when it has been sanded to bare wood. Do you think any Jatoba will be the same? It’s 5” -3/4”. Is there a difference from one seller to the next? No way to tell until it has been installed and then allowed to darken. 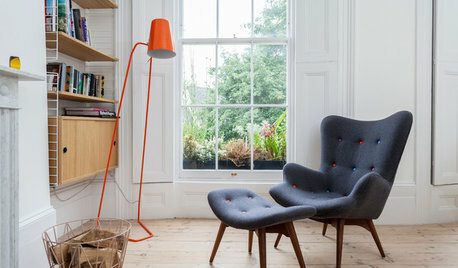 A 5" solid Jabota will have the same appearance but you won't know what colour range you will get until it is too late. sorry, I meant in terms of quality. Is all of it basically the same, and the guy selling it for 5 per square foot vs 10 or 15 are all selling the same stuff? Pretty sure when stained brown it will be brown and not red. Your tile is cracked but is it loose? If it isn't actually coming off the mortar bed you could try to stiffen the joists if you have access from below. If they are traditional solid wood joists, sistering them with 2x10 metal studs to take out deflection is not that hard or expensive. You could also add a support wall mid-span. It is also possible that your floor has plenty of support on paper, but if it was put in when the house was new, the house just moved around too much because the framing dried out. The FIRST step here, is getting a tile expert on site IN PERSON to take a look at the framing under the floor and see why the tile has cracked. To get that floor up you are looking at pulling your kitchen apart, jackhammers, the works. That radiant heat is likely embedded in a 3/4" cement layer. You ready to do that? Because honestly for some framing reinforcement at $1,700 to save the floor I'd go that route unless you are ready for major remodeling. Like SJMcCarthy, I suspect the travertine was laid on top of the original tile floor. Look at the rise of the first step of the staircase. That may tell the story. Another possible clue is that the baseboard in the rooms with the travertine isn't as tall as the baseboard in the rooms with the wood floor. IF the travertine has been laid on top of a tile floor, that is one whole heckuva' lot of dead weight on the floor joists. Very likely that the floor system was not engineered to carry the weight of tile/ stone x 2. IF that is the case, IMO, the smart thing to do is tear out. *ETA, if the rise of the first step of the staircase is significantly less than the rise of the rest of the steps, that is another huge stumbling hazard (along with the high transitions from wood to stone). And a code violation. Riser heights can vary no more than 3/8". 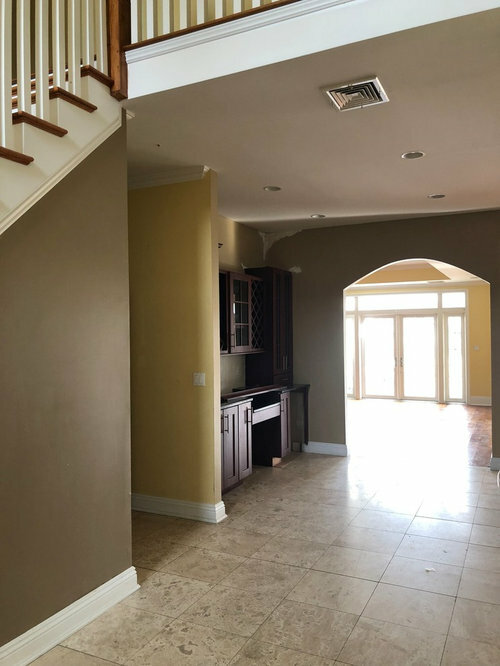 How to fix this misfit, angled fireplace in family room? Blend/Change? knock down the wall to open up space?